“. . . this novel clicks. . . the senator and the beautiful insider come across as complicated, sometimes contradictory and often unpredictable people, just like you and me. 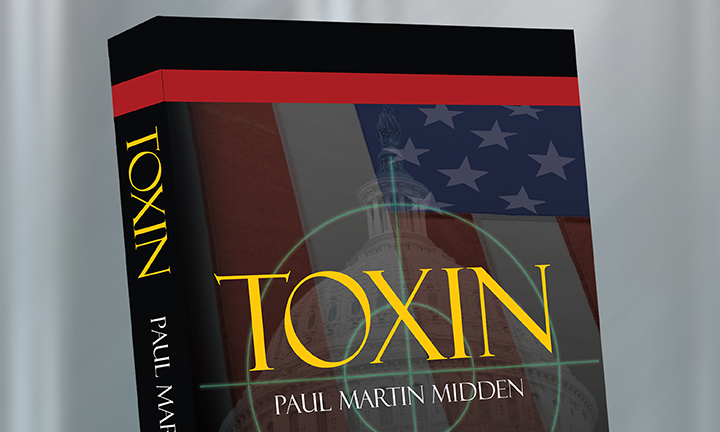 They give "Toxin" an edge on much of the thriller competition. Jake Telemarck is a junior senator from Wisconsin who enjoys his position as a moderate, common-sense legislator. His life is moving along nicely until he receives a phone call from Isadore Hathaway, the daughter of a famed but deceased US senator. Isadore arranges a clandestine meeting with Jake to tell him about a plot by a group of fanatical right-wing evangelicals (the Bookeepers) who plan to destroy US democracy and replace it with a theological oligarchy. She wants him to kill these men. Jake is taken aback at first and refuses to get involved. Isadore bolsters his motivation by telling him that he has been targeted by this group as a potential obstacle to their plan. In addition, he realizes that Isadore has discovered a part of his past that had long been buried. When in the military, he was part of a secret group of assassins. Jake refuses to get involved until parts of Isadore’s scenario start to come true. Despite his vow to himself never to harm another person, he agrees to help Isadore stop these men. But the rebellion is deeper and more entrenched than he believed, and events conspire to put Isadore and Jake—as well as the US government—on the defensive.